Developer: "Some Company in China Stole My Game"
That was the alert from Reddit user Fragsworth. It seems that China's Tencent gaming platform Pengyou and the Tencent app store have what looks like an exact copy of his indie game Cloudstone. It's pretty clear that they blatantly, seriously ripped us off. They took our files, reverse-engineered the server, and hosted the game themselves with Chinese translations. They stole years of our hard work. We have no idea how many users they have or how much money they're making, but they have a pretty high rating on that site and they might be profiting off the stolen game more than we are. 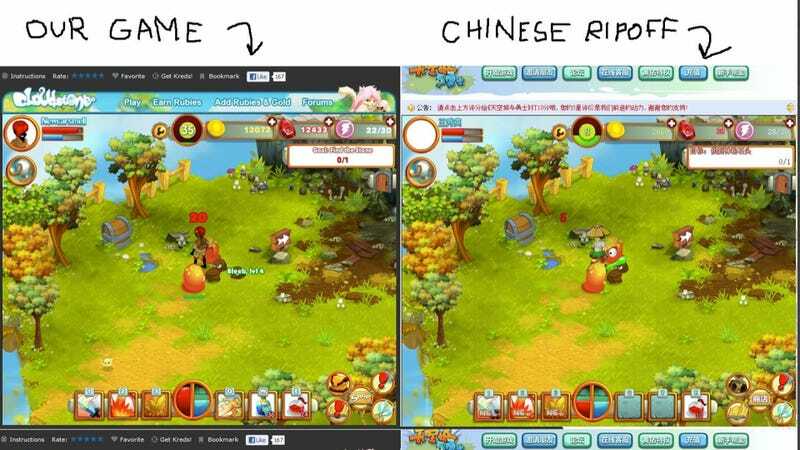 You can see a comparison between Cloudstone and the alleged knockoff, which is called QQ Sky City and Warriors. . It does look like the indie game was completely copied. "I always heard about how companies would do this kind of crap," Fragsworth told Tech In Asia, "but never thought it'd happen to us."